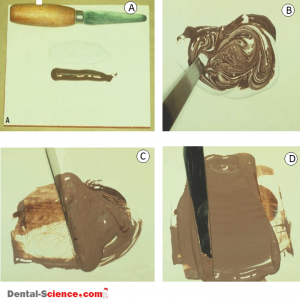 – Polysulfide impression material was the first non aqueous elastomeric “rubber” impression material developed for dentistry. polyether and silicone materials are also rubber materials. – They all undergo cross-linking and chain lengthening polymerization reactions. – They have similar, but not identical, mixing and handling properties. adhesive that is used to bond the impression material to a non perforated tray. – Polysulfide materials set via a condensation polymerization reaction. – Biologic polymers (proteins) are important components of the tissues of the body. – In a typical condensation reaction, a hydrogen atom and a hydroxyl group (OH) are taken from monomers and are combined to form water (H2O). – The functional groups of polysulfide impression material are mercaptan groups (sulfur and hydrogen atoms) and oxygen from lead oxide. – Reaction by-products other than water are produced by other condensation polymerization reactions, but water is the most common by-product. – The name “condensation” polymerization is based on the production of water. 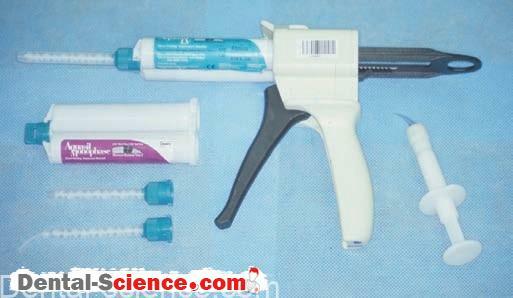 – Polysulfide impression materials are supplied as two pastes in tubes. – Typically, one paste is dark brown, and the other paste is white. 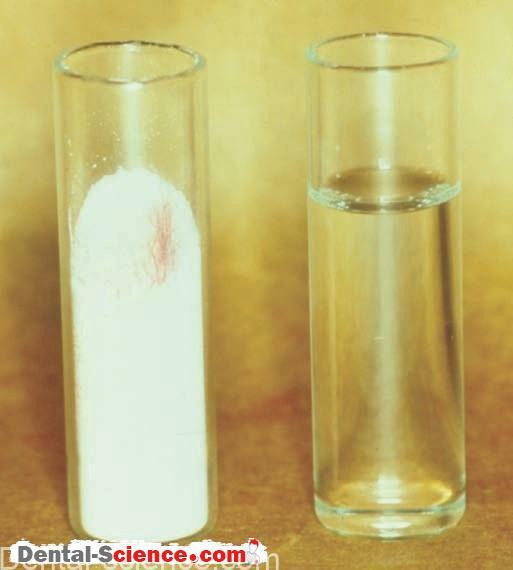 – The white “base” paste contains a low-molecular-weight polysulfide polymer mixed with an inorganic filler, such as titanium oxide. – The brown “accelerator” paste contains lead oxide and an “oily” organic chemical that does not react. – A small percentage of sulfur is also included in the brown paste because it promotes the polymerization reaction. – The two pastes are dispensed in equal lengths on a paper mixing pad. – An impression material spatula is used to mix the two pastes. – The impression material spatula has a long (~4”), straight-sided blade. – The pastes are swirled and stropped together until a homogeneous paste is obtained. – The side of the spatula blade is used to scrape unmixed material off the paper pad and then to mix it into the rest of the material. – The mixed material is loaded into the tray and placed in the mouth as a viscous paste. – The same procedure is used to mix other non aqueous elastomeric impression materials, such as polyether and silicones. – The polymerization reaction starts when mixing begins and proceeds slowly. – The low-molecular weight polysulfide polymer has mercaptan groups (–SH) on the end of the short polymer chains and as pendant groups hanging off the middle of the chains. – Two hydro gen atoms from two different short polymer chains react with oxygen (from the lead oxide) to form water. – The sulfur acts as a catalyst and helps to link the two sulfur atoms together, joining the two polymer chains together. – The same reaction lengthens the polymer chains and crosslinks the chains. – Polysulfide impression materials are much more accurate than alginate. 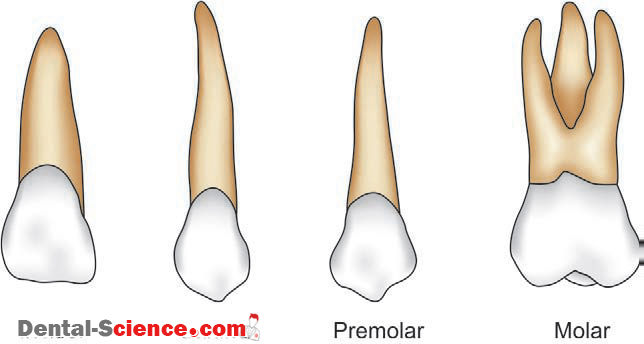 – With proper handling, polysulfide impression materials can be used for inlays, crowns, and bridges. – However, they are not as accurate as other non aqueous elastomeric materials. 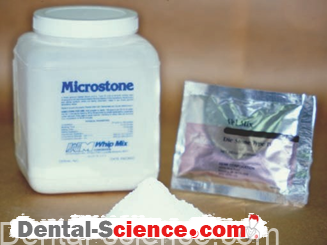 – A polysulfide impression should be poured within several hours after mixing. – Custom trays are recommended for optimum results. 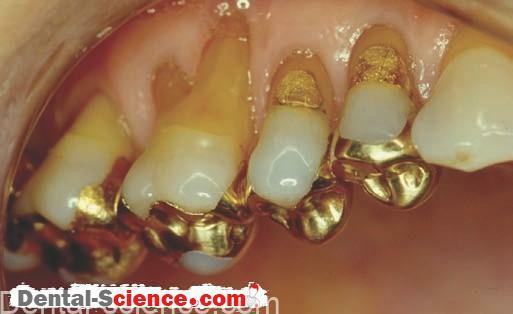 – Polysulfide impression materials have a disagreeable smell and taste. – They stain clothing and are generally regarded as unpleasant materials. – Polysulfide impression materials do have one advantage: they have the longest working time of any elastomeric material (4 to 6 minutes). – As a result, they are useful for impressions of multiple preparations. – Along with the long working time comes the longest setting time. – Impressions need to be held in place in the mouth for as long as 15 minutes. accelerated by heat and humidity. – The setting time on hot, humid summer days will differ from that on cool, dry days. 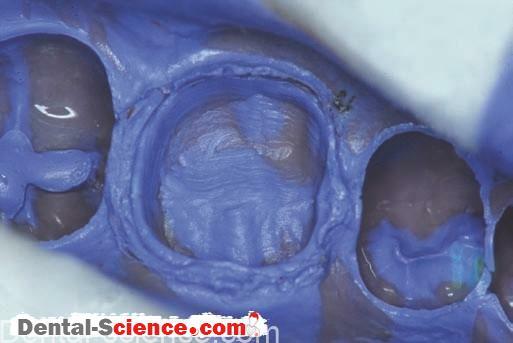 – One technique using polysulfide impression material for a full-denture impression is to mix a drop of water with the material to accelerate the setting. 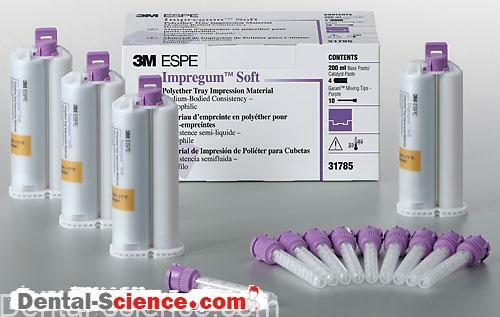 – Polysulfide impression material is often used with custom trays to increase the accuracy of the impression. preparation, and heavy-body material is used in the tray. 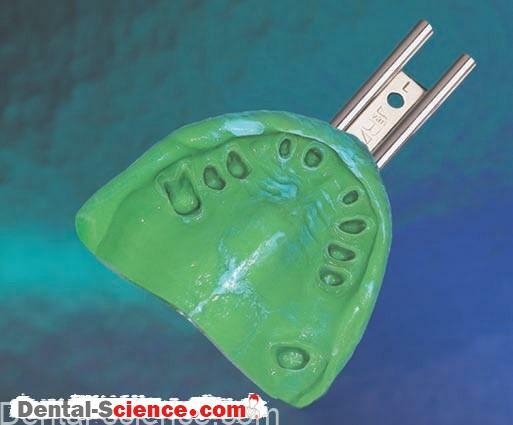 – Light and medium-body materials are used for full- denture impressions. – Subsequent pours using the same impression may not have the required accuracy.